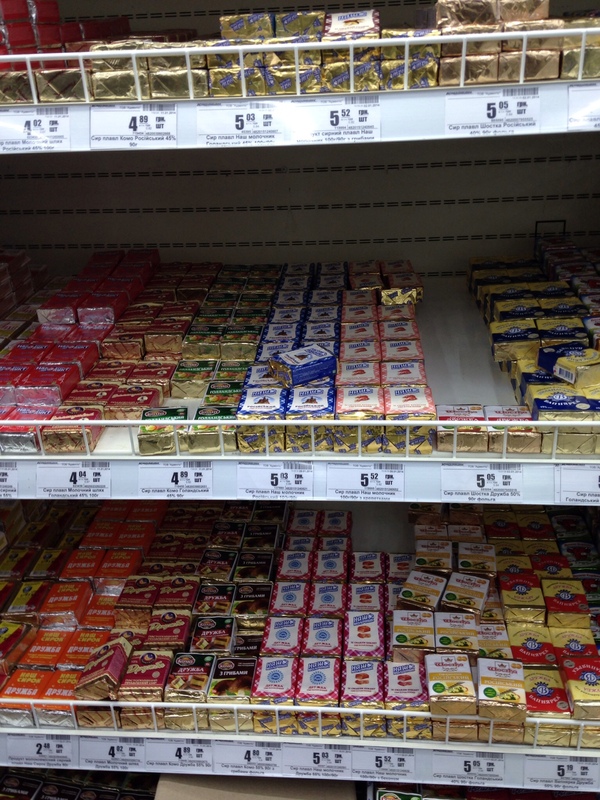 My friend Crystal and her husband moved to England just a couple weeks before we moved to Ukraine and she wrote a blog post about what grocery shopping is like in the UK. 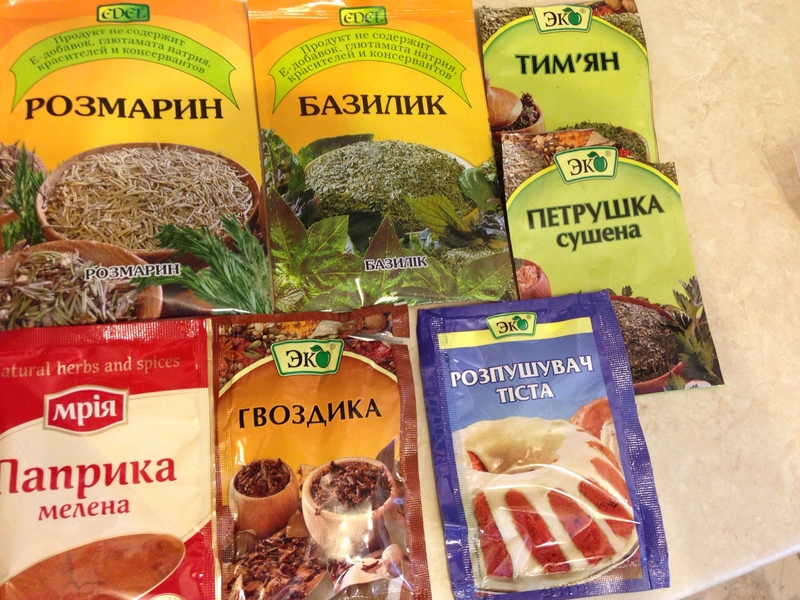 It was so fascinating that I was inspired to tell you all about my grocery shopping experience in Ukraine! Are you ready for this? Let’s do it. 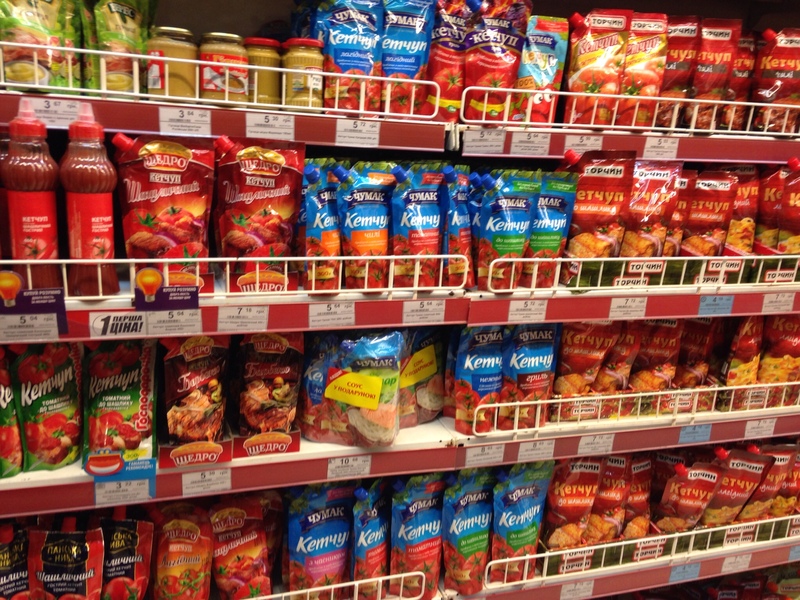 One thing you need to know is that there are several different types of grocery shopping experiences available here in Ukraine. It all depends on how how much you want to dive in to the culture and how much you want to try out your language skills. 🙂 First there are the old Soviet type stores that are on just about every corner. They are always close by and often times are even in the first floor of apartment buildings! 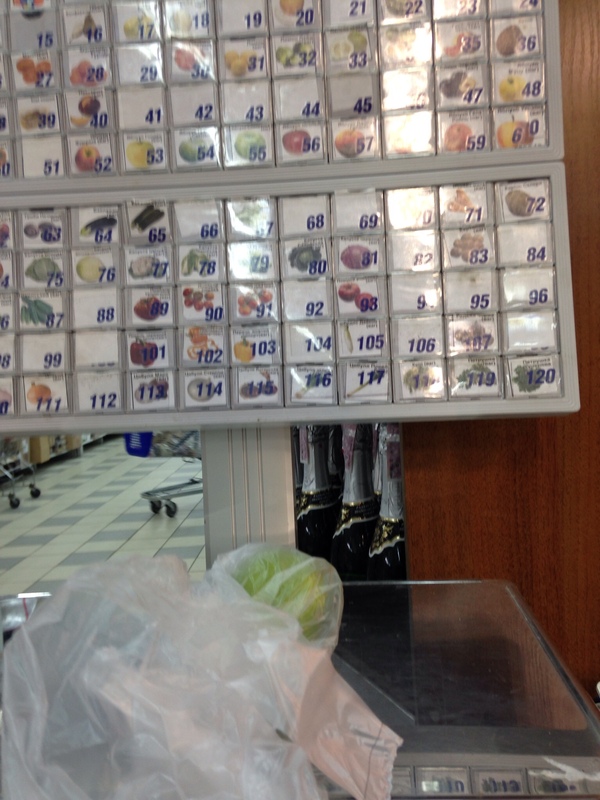 The majority of Ukrainians don’t have a car, so it’s extremely important to have grocery stores close by. 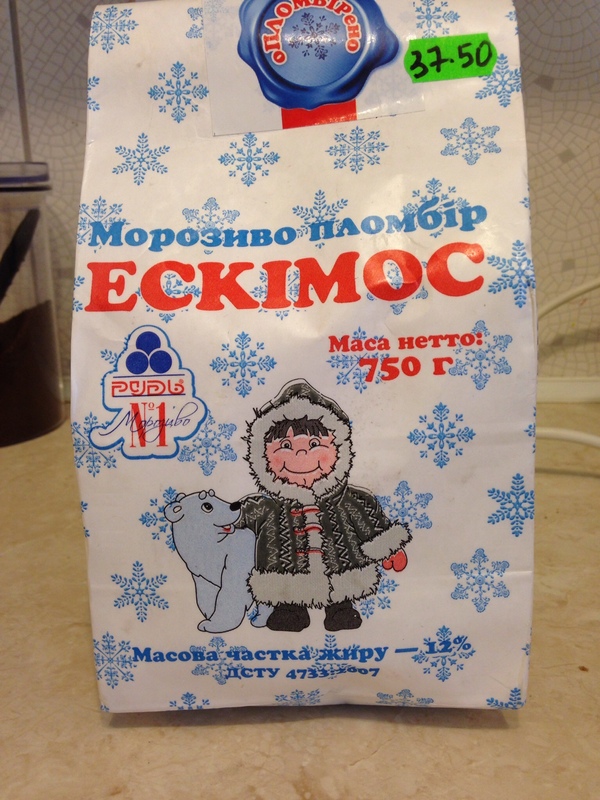 The Soviet stores sell milk, bread, eggs, water, candy, mayo, salami, and cheese…you know, the basics. 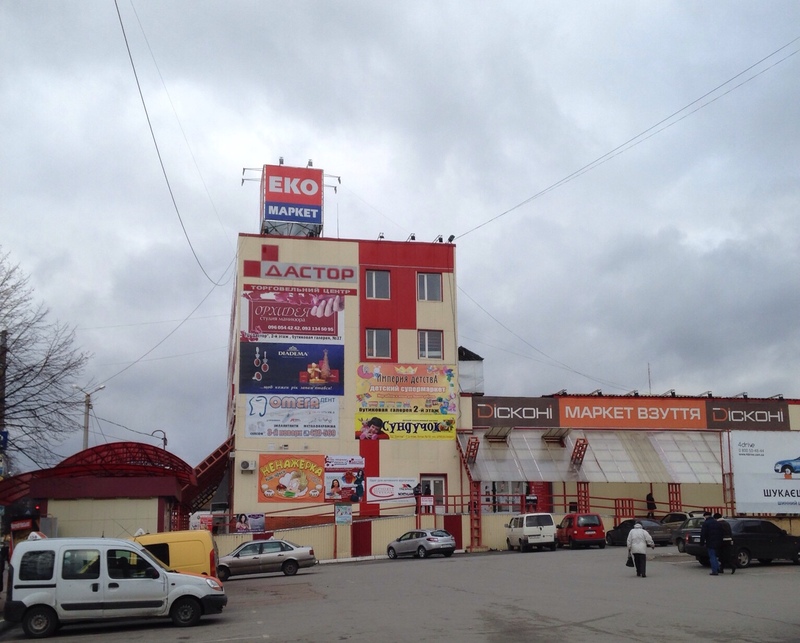 People refer to them as the old “Soviet” style because back in the day of the USSR these were the only types of supermarket stores around. When you walk in there is generally one big counter, or two counters with an aisle in the middle. The employees stand behind the counter and get you whatever you ask for. You can’t just browse and fill your cart. Each section of the counter has an employee responsible for that section and that certain employee is the only one who can help you with those products. You pay each employee separately, even if you are buying several things from different sections. 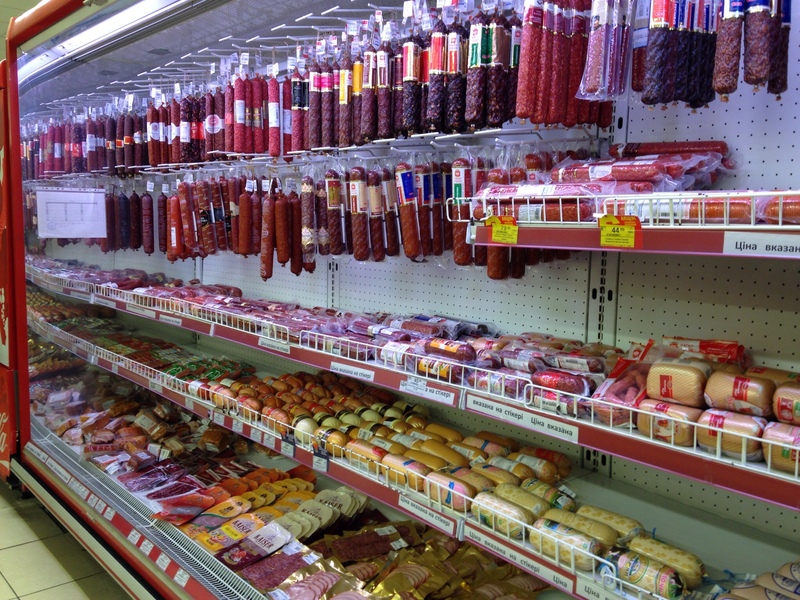 Stores were set up in this way during the USSR to control how much of each product was allotted to each family. These stores get an A+ for accessibility, but a D- for American ease of use. I mean, I have to know what something’s called to be able to ask for it…right? Luckily our corner store ladies are getting to know us and they know the things we like. Also, we are getting better at asking for what we want. These stores are good for us, but also a bit intimidating. 🙂 I didn’t take pics of these stores because they are tiny and I’m pretty sure I wouldn’t be able to be that discreet. You’ll just have to use your imagination! These are the stores we go to pretty much daily for the basics that go bad quickly. The second type of grocery shopping available we affectionately call “You know those Babushkas on the side of the road”. Ha! On our main street there are several grandmas who bring in produce and homemade canned items and they sell them on the sidewalk. I’ve bought pumpkin from them a few times. That one’s a little difficult because you need to pretty much have exact change for what you want. But, the food is fresh and good! The third type of grocery shopping is shopping at the big open market. That shopping deserves a post all it’s own. I’ll get right on that! 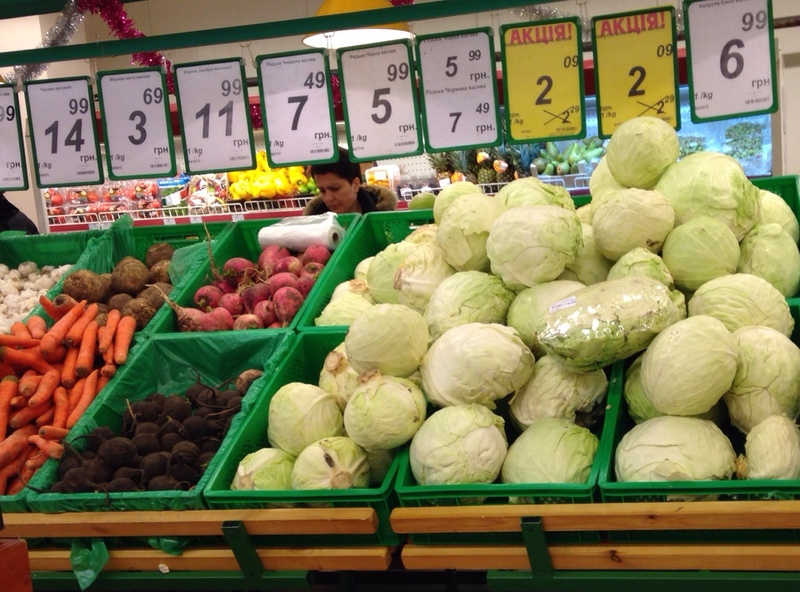 The fourth type of grocery shopping is the one I’ll describe in detail for you today. 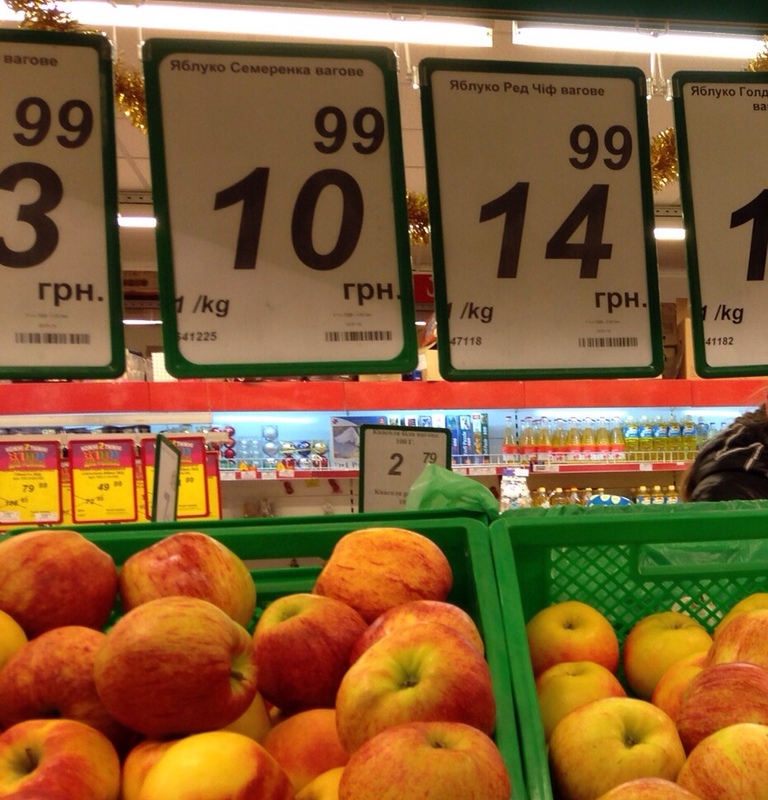 This is your basic supermarket shopping. This is most like American shopping, and the type of shopping we do at least twice a week. Food goes bad more quickly here, and like I told you before, we have to carry all we buy, so we shop a lot more frequently here than we did in the US. This is the supermarket we shop at the most. It’s like a 5 minute walk from our house. Jed’s dentist is on the second floor. BONUS! This is the biggest grocery store in town. It’s located in the mall. Look at all those checkouts! Sweeeeet. 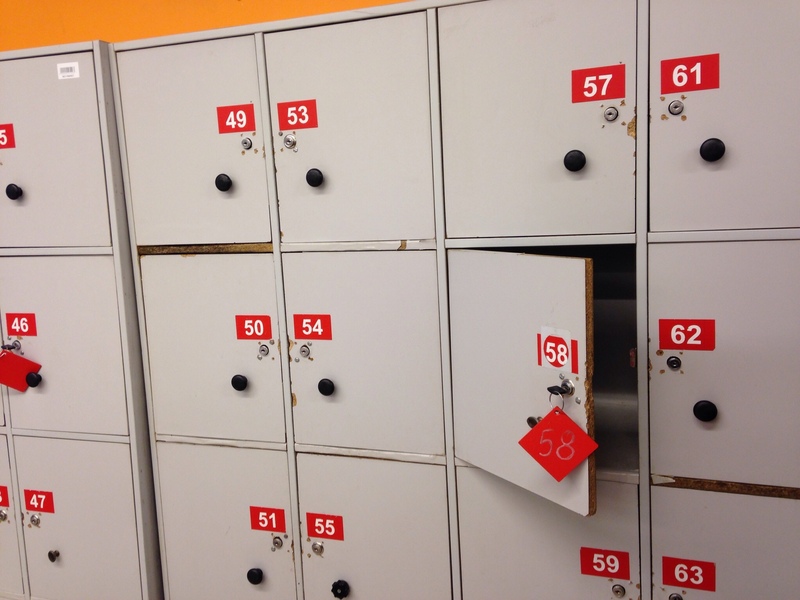 Every store, wether it be an electronics store, a pharmacy, or a grocery store has lockers at the entrance where you MUST lock up any bags or backpacks. They also have security men who stand at the entrance/exit to check receipts and make sure you lock up your bags. 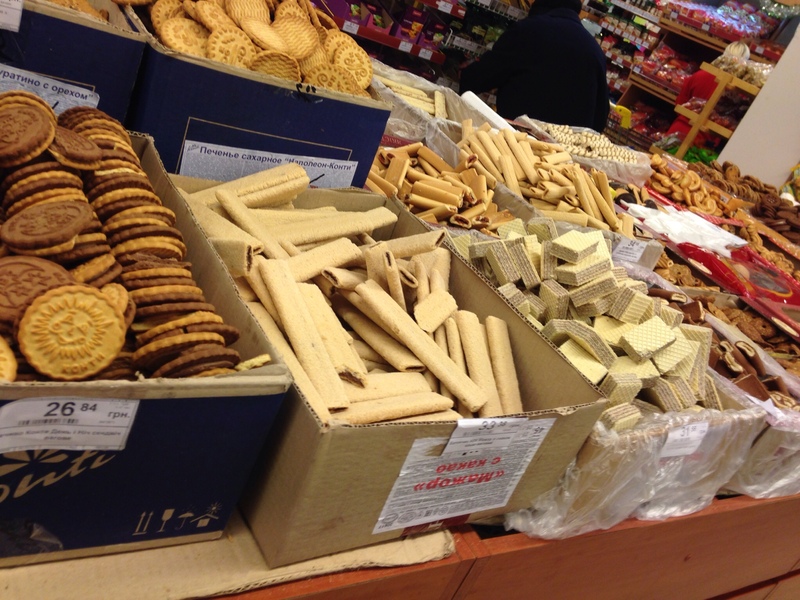 Ukrainian stores have LOADS of bulk type items. In some stores you find an employee to weigh your items for you, and at some stores you weigh them and put in the code yourself. 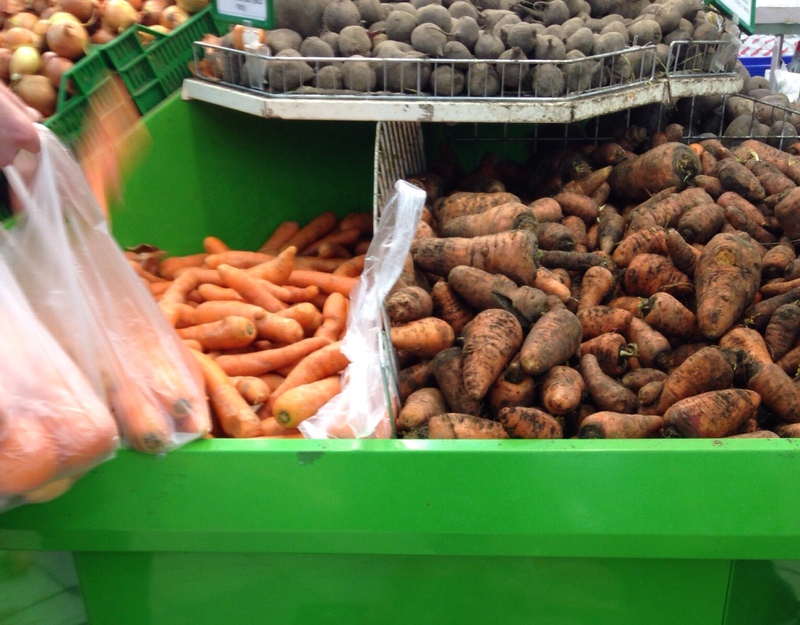 Most carrots, beets, and potatoes are sold SUPER dirty. But, you can pay a bit more for clean carrots. I don’t understand if there’s any other difference other than one type is clean and one is dirty. I usually buy the dirty, unless I’m in a hurry and know I won’t have much time to scrub. 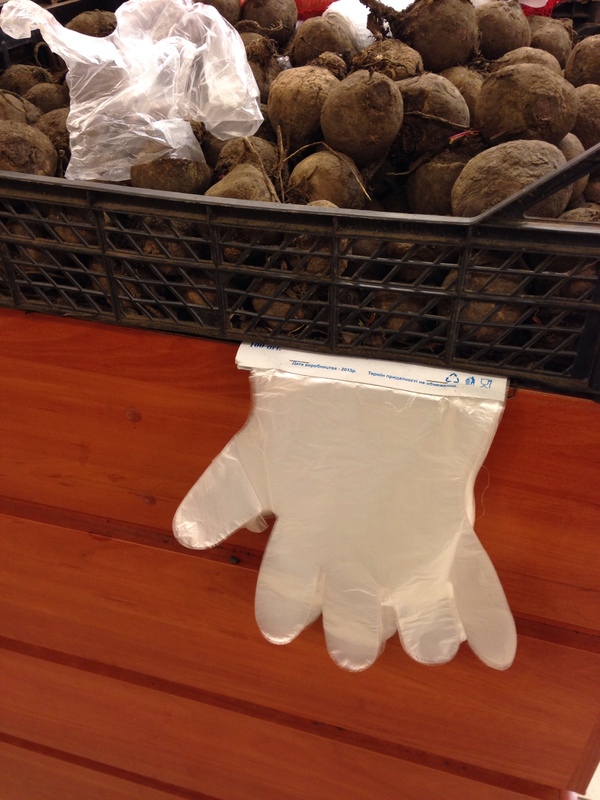 You put the plastic gloves on your hands when you’re picking through produce. At the big mall grocery store you weigh your item yourself, push the little button for that particular item and a sticker pops out that you put on the bag. I like it! Just right out there in the open without a cover. Ha! This is like the worst temptation for Seth. He doesn’t understand why he can’t just grab one! 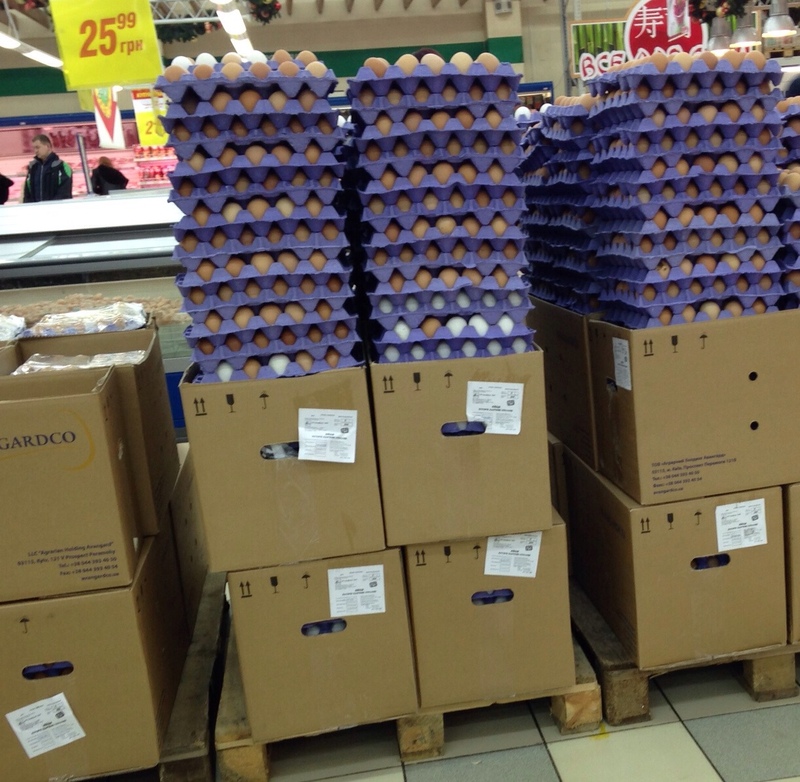 You can even buy eggs in bulk! You can put as many as you want on a flat, or you can put several in a bag to take home. The eggs sold this way instead of in the carton are sold individually by egg. 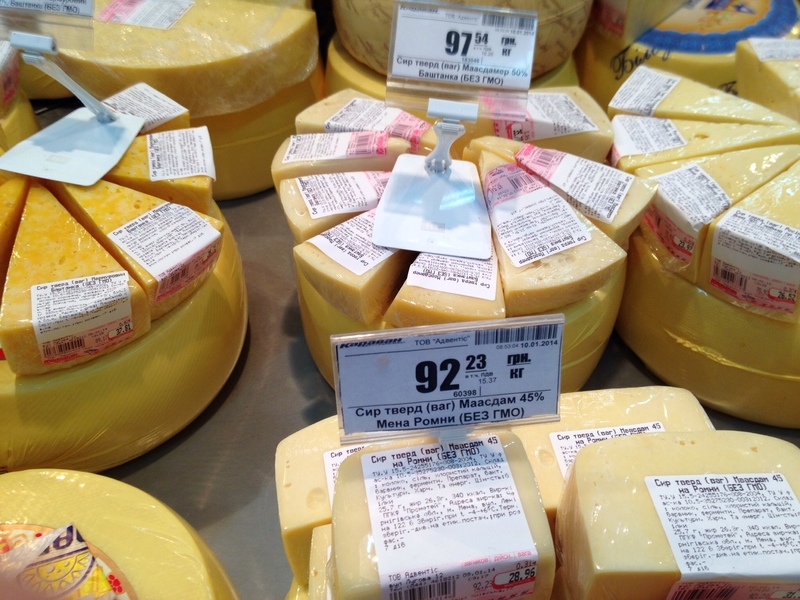 How in the world do you choose your cheese?? So many options!!! 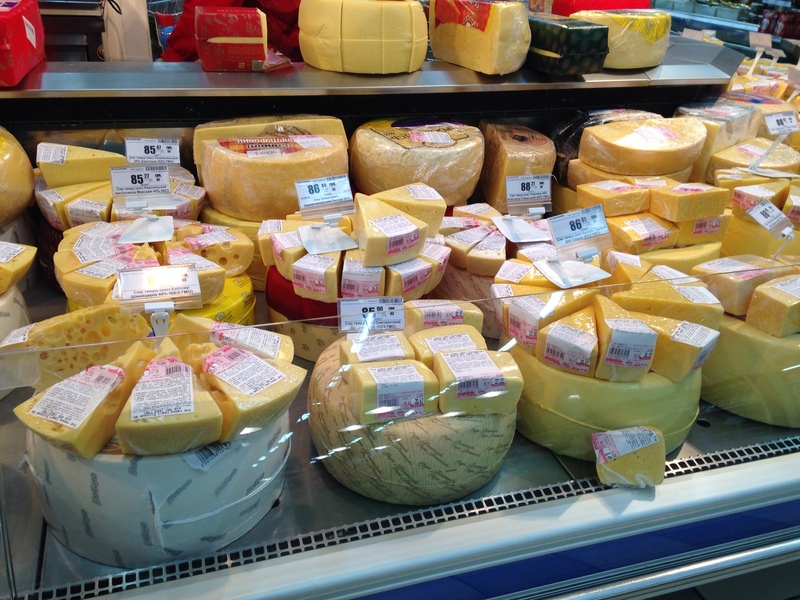 Pieces of cheese are sold by the kilo. 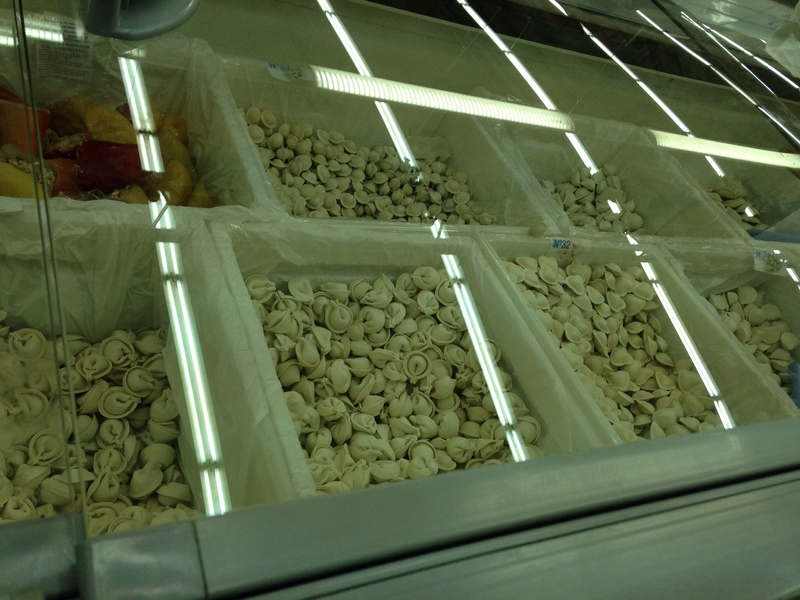 It’s funny how much you can learn about a culture just by browsing around in the grocery store. 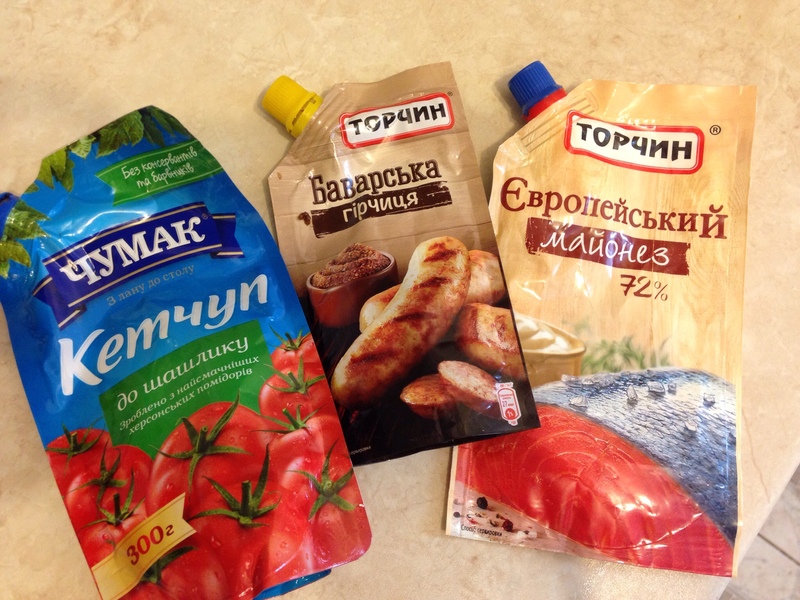 A couple obvious things you should know about Ukraine: Ukrainians have a love affair with mayonnaise and all things dairy. 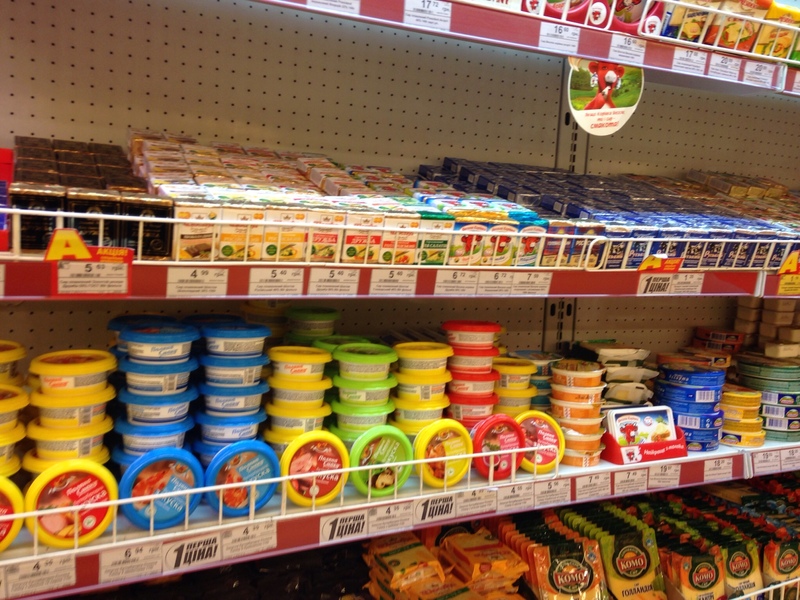 The mayonnaise aisle (yes, aisle) and dairy product aisle is quite an impressive affair. 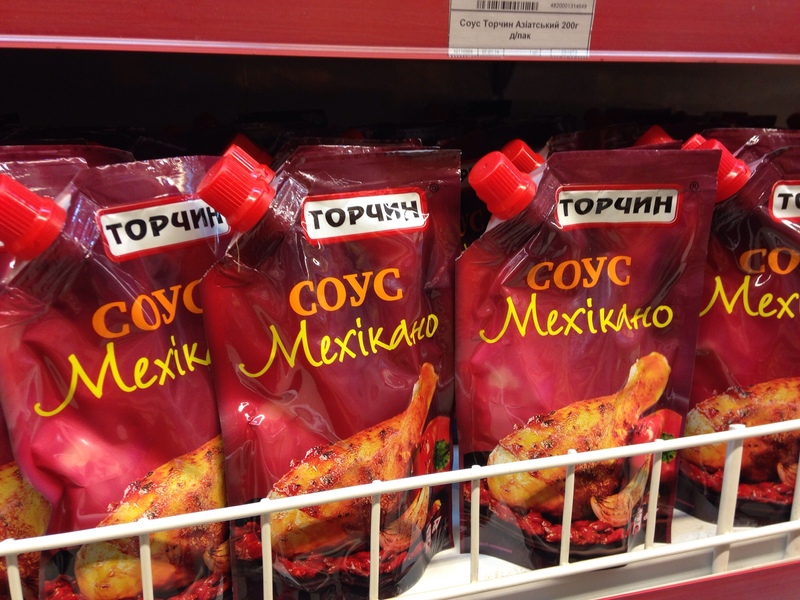 Behold, Mayonnaise, the King of Ukrainian condiments! 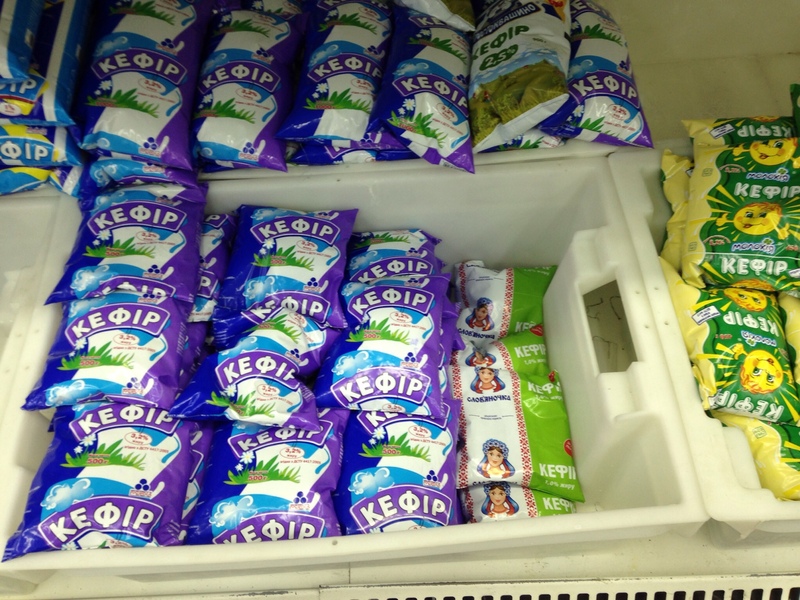 Kefir is a big thing here too. Nice! Good for the ol’ tummy. 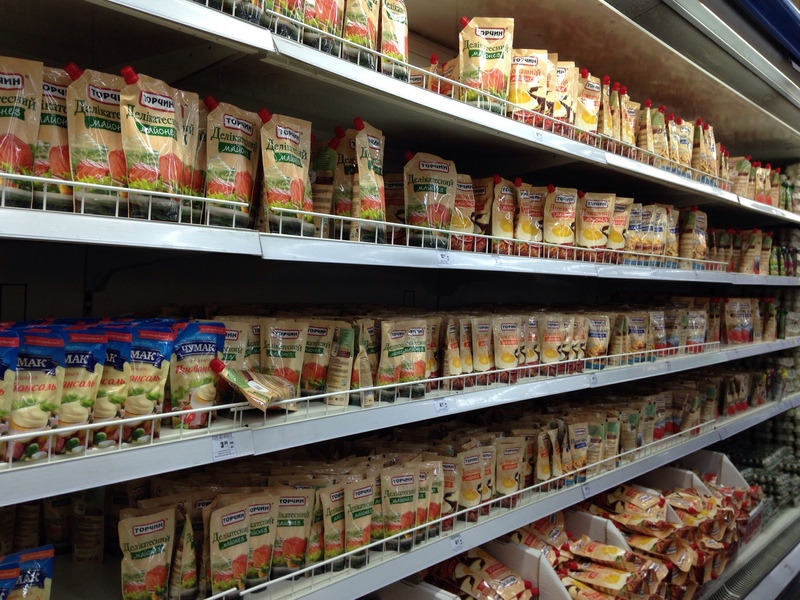 Lots and lots of products here are sold in bags, rather than in bottles or jugs. Like milk, mostly all condiments, spices, yogurt…It’s super helpful when you have to carry all your groceries home. It also helps cut down on waste since most homes don’t have the ability to recycle, and like at our house, many people have to walk at least a block to take out the trash. Bagged goods make a lot of sense! I like it! Ketchup, ketchup, and more ketchup. 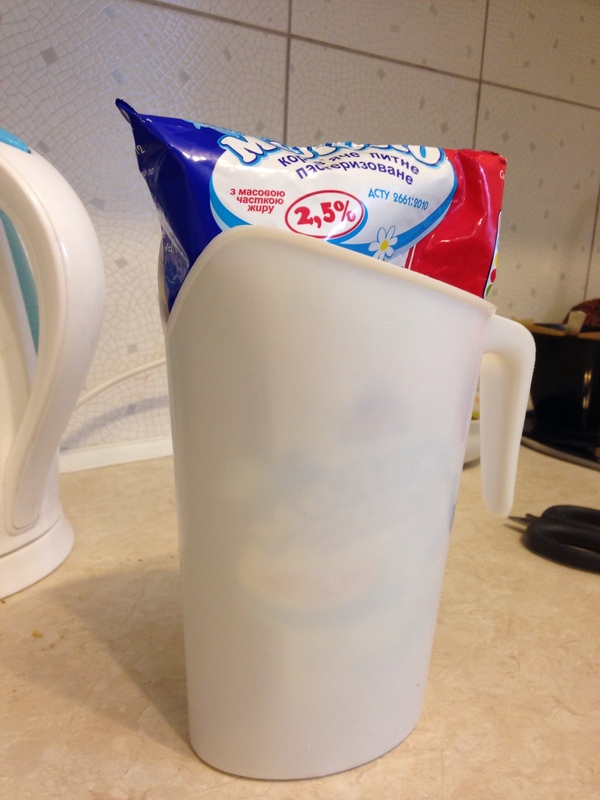 We have this handy-dandy little pitcher to hold our bag of milk once we’ve snipped the corner open. Here’s just some other random things I thought you might find interesting. 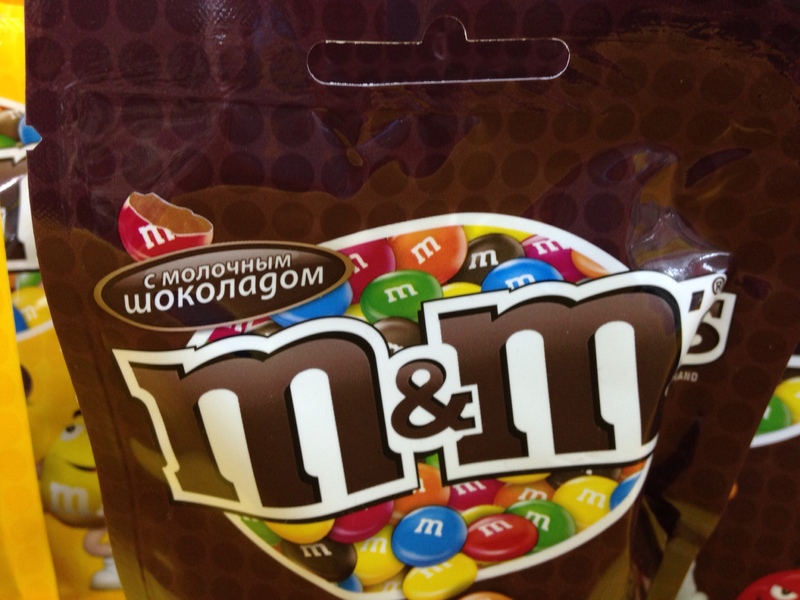 All my Ukrainian friends are laughing their heads off at me at this point. Sorry guys, we Americans are really easily amused. 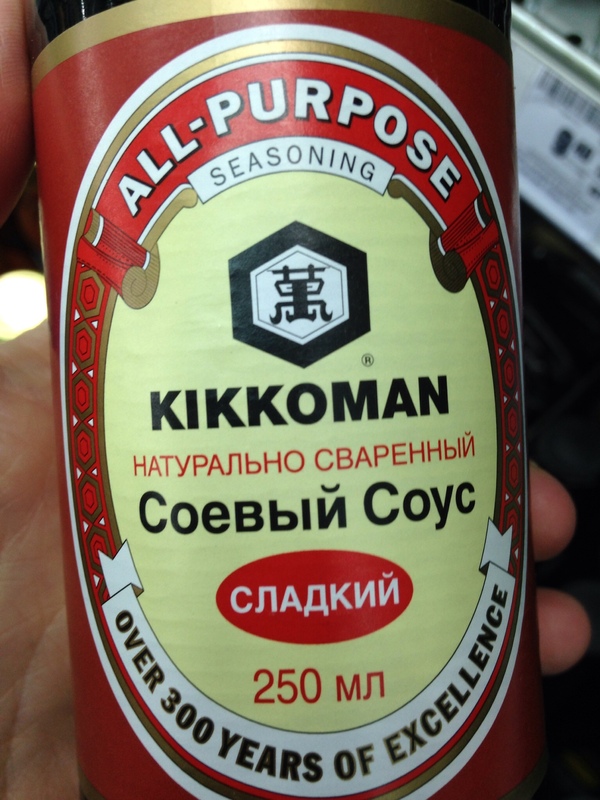 Soy sauce is easy to find. There is also a surprising amount of pad thai rice noodles. Strange, because I don’t know anyone who buys these things…except us. 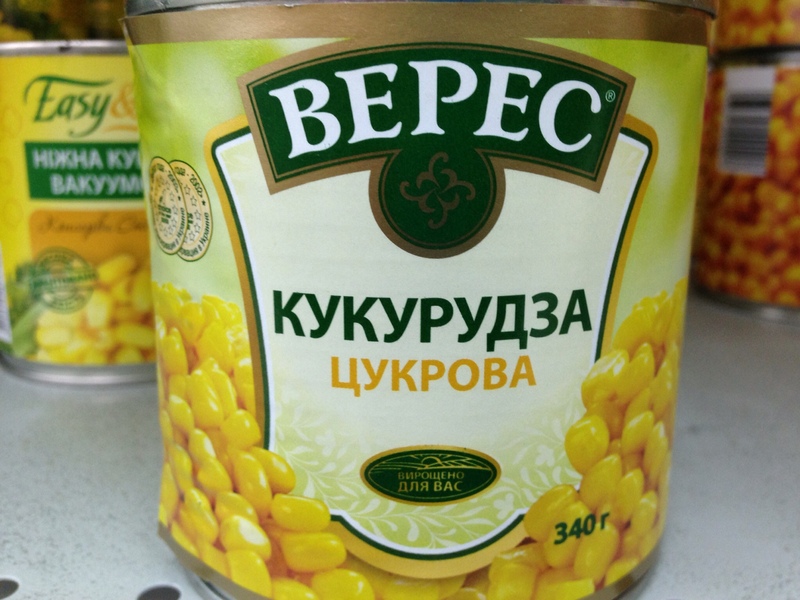 Canned corn and peas are sold like they’re goin’ out of style. Super popular! 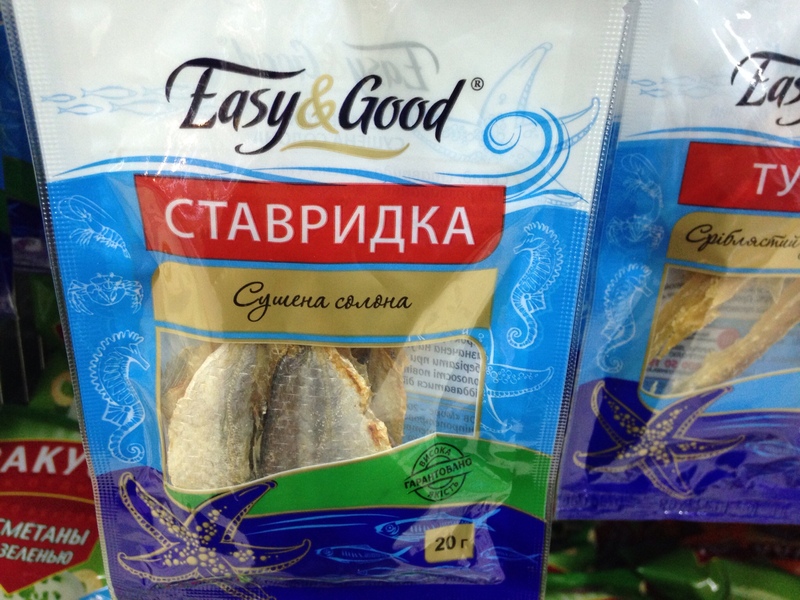 Right near the jerky you can find tons of dried fish. No thanks. The amount of liquor found in the stores is pretty astounding. At the big store in the mall there are 4 full aisles (both sides) dedicated to alcohol, that doesn’t include wine or beer. 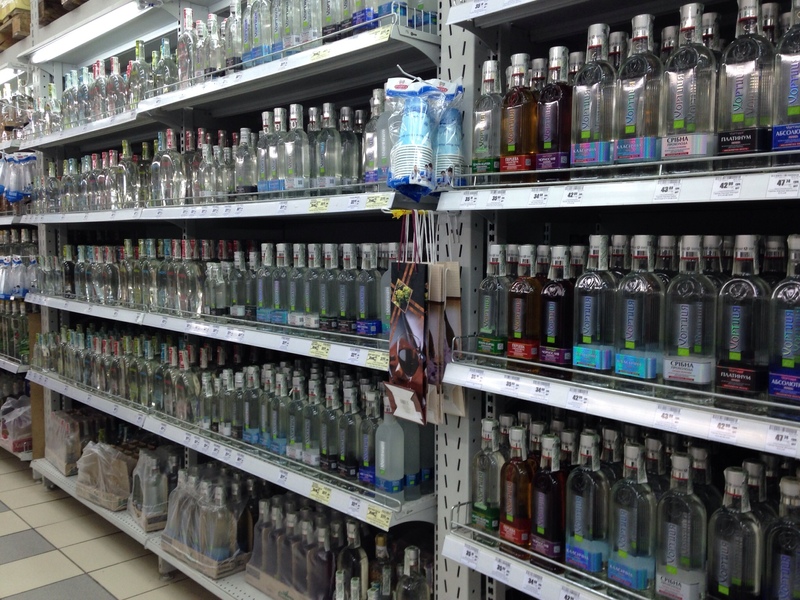 One full aisle (both sides) is dedicated solely to vodka. Think of all the homemade vanilla I can make! 😉 There is almost just as much dedication to chocolate. Now THAT’s more like it. So, there you have it! 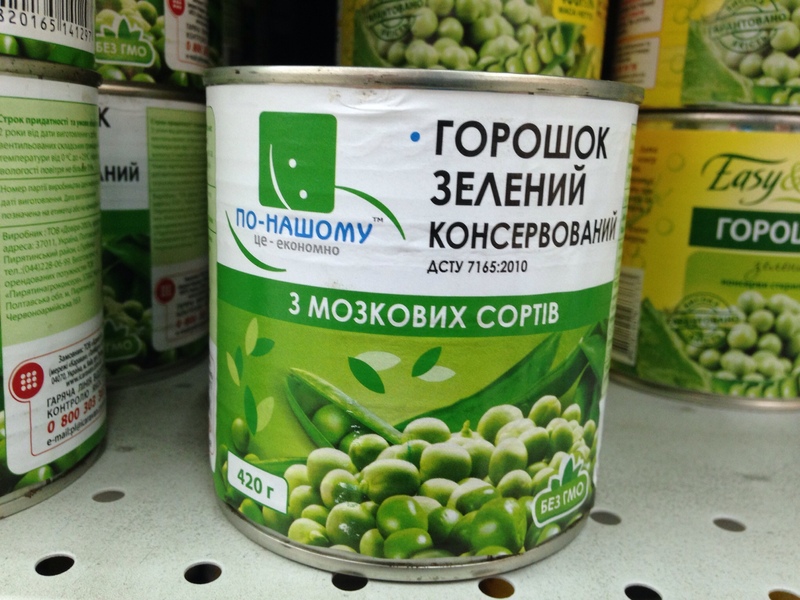 That’s grocery shopping, Ukrainian style, in a nutshell. We are slowly learning more and more about what products are good, how pricing works, and how shopping happens best for our family. I’m working on evaluating prices in grivnas instead of trying to convert every price to dollars in my head. My brain can’t handle all that division. I just need to get used to what things cost here and get over it. 🙂 In the long run that will be much easier. We’re doing more shopping from the outdoor market these days, so I can’t wait to share that experience with you. It’s a whole other level of Ukrainian culture of which I have MUCH to learn. When you go up to pay the cashier will always ask you if you want a bag. You have to answer if you want a big bag, medium bag, or small bag, and then tell them how many bags you want. You pay for each bag, so it’s a good idea to bring your own. I like that method. Yay for less waste! LOVE, LOVE, LOVE this post! Shopping in U is quite the adventure, isn’t it? 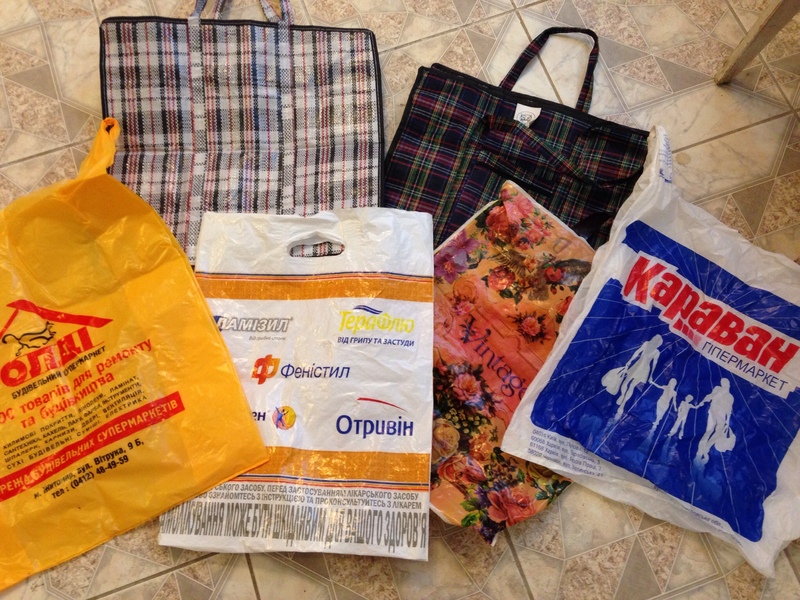 I just walked a mile and a half down the road to our local (small) supermarket, bags handily stashed in my pocket. :-). Can’t wait to read your post on open markets. They are such an adventure! 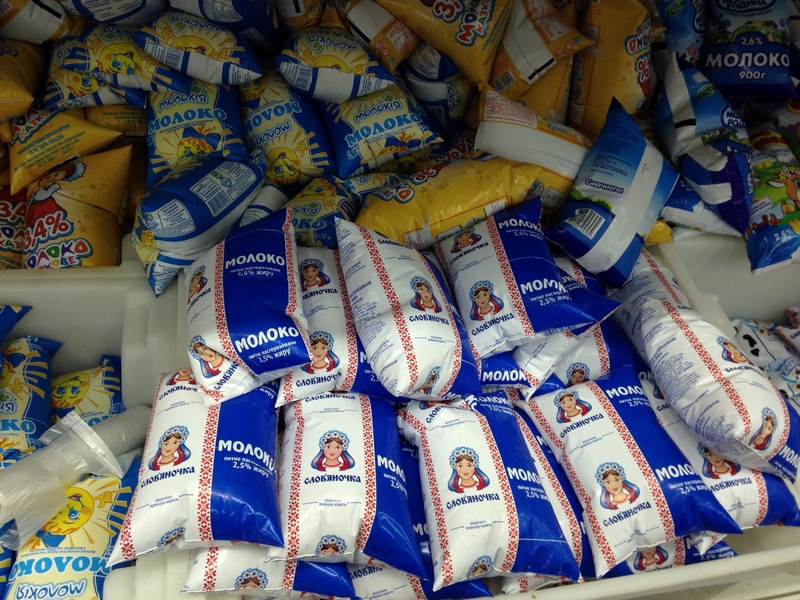 Thank you for posting the picture of the baking powder! I was despairing of ever finding any! 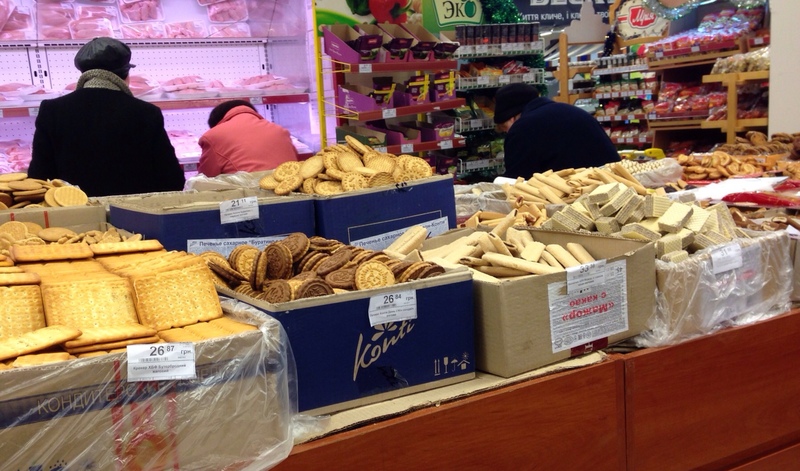 I thoroughly enjoyed reading this post about one of my favorite grocery stores in Zhytomyr. 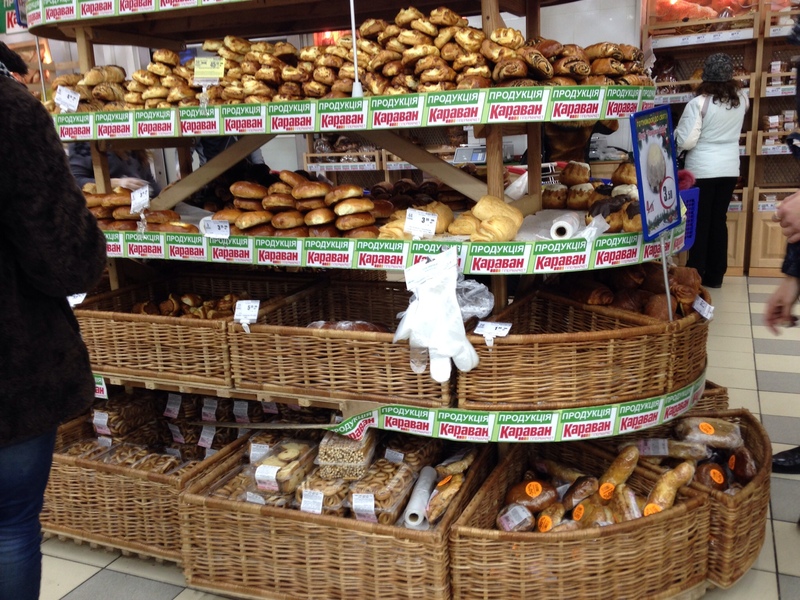 I have been in Ukraine for 7 years now, and always enjoy hearing people’s first impressions of food in bags and little pkgs of baking powder and babushkas and all the other things that make shopping in Ukraine an adventure. We are so priviledged here, it just takes time and effort and a dictionary and sometimes lots of questions to find what you are looking for.